Good design has the potential to provide better education, access to safe water and improved health care. Take for instance our very own Emily Pilloton of Project H Design, whose design projects are bringing vast improvements to their surrounding communities. 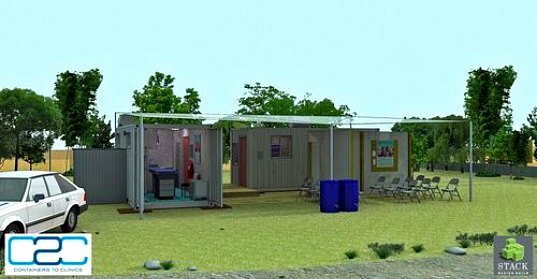 Along the same line, a new non-profit initiative called Containers 2 Clinics is creating modular health care clinics for developing countries. To do so, they are rescuing shipping containers and then outfitting them with all the necessary equipment to treat women and children. Not only is this company delving into the fascinating world of shipping container architecture, but they are developing a much needed service for humanitarian aid. The start-up organization’s plan is to retrofit and standardize shipping containers for use as health care clinics. These structures could be shipped in a standard way and easily transported on the back of a flat bed truck to the needed location. The standard configuration would consist of two shipping containers, renovated to allow space for patient consultation rooms, a laboratory, an office for staff and an inventory area. A container clinic could serve as a stand alone facility or augment a current facility. The containers are modified to provide ventilation, lighting, sterile lab and consultation space. At this time, the containers are meant to connect with current utility lines drawing on power from the grid, but they could easily be adapted to run off solar or wind power for off-grid applications. Along with providing much needed health care facilities for developing areas, Containers 2 Clinics also plans to provide additional value in the world of health care and the local community. C2C will also be a vital part of a data collection system to capture health and epidemiological data to gain a better understanding of disease vector control. Staff for the clinics will be found within the local community and job training will be provided by C2C. The clinic model also includes a low-cost pharmacy for medicine and essential health commodities, which will help provide revenue for the clinics as well as a chance for local entrepreneurship. Currently Stack Design Build, a Rhode Island-based green builder, is constructing the first prototype, which should be complete this November. This is definitely an exciting humanitarian design concept that could have incredible results. 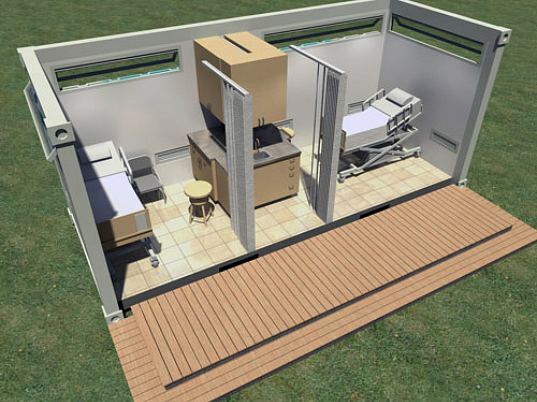 Low-cost and easily transportable, these standardized clinics could become part of the solution for better health care in many parts of the world. Hey excellent Info. It is much useful Later you Think about it. Increasingly obliging. Aloha. We're looking into retrofitting containers into medical clinics. Do you retrofit them with eloectricity, insuoation, heating, windows, ac and cabinets? Do you have a blueprint you sell for that? We here at Insurance Quotes Org have been actively involved in helping victims in Haiti in the past couple of days and have been looking for more solutions for the medical side of things. These containers are perfect for this crisis.